The observable traits expressed by an organism are referred to as its phenotype and its underlying genetic makeup is called its genotype. Mendel used pea plants with seven distinct traits or phenotypes to determine the pattern of inheritance and the underlying genotypes. Mendel found that crossing two purebred pea plants which expressed different traits resulted in an F1 generation where all the pea plants expressed the same trait or phenotype. When Mendel allowed the F1 plants to self-fertilize, the F2 generation showed two different phenotypes, indicating that the F1 plants had different genotypes. The observable traits expressed by an organism are referred to as its phenotype. An organism’s underlying genetic makeup, consisting of both physically visible and non-expressed alleles, is called its genotype. Johann Gregor Mendel’s (1822–1884) hybridization experiments demonstrate the difference between phenotype and genotype. Mendel crossed or mated two true-breeding (self-pollinating) garden peas, Pisum saivum, by manually transferring pollen from the anther of a mature pea plant of one variety to the stigma of a separate mature pea plant of the second variety. Plants used in first-generation crosses were called P0, or parental generation one, plants. Mendel collected the seeds belonging to the P0 plants that resulted from each cross and grew them the following season. These offspring were called the F1, or the first filial (filial = offspring, daughter or son), generation. Once Mendel examined the characteristics in the F1 generation of plants, he allowed them to self-fertilize naturally. He then collected and grew the seeds from the F1 plants to produce the F2, or second filial, generation. Mendelian crosses: In one of his experiments on inheritance patterns, Mendel crossed plants that were true-breeding for violet flower color with plants true-breeding for white flower color (the P generation). The resulting hybrids in the F1 generation all had violet flowers. In the F2 generation, approximately three-quarters of the plants had violet flowers, and one-quarter had white flowers. 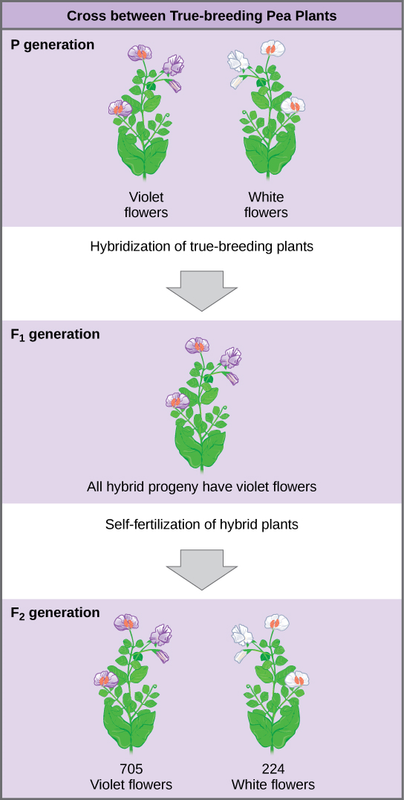 When true-breeding plants in which one parent had white flowers and one had violet flowers were cross-fertilized, all of the F1 hybrid offspring had violet flowers. That is, the hybrid offspring were phenotypically identical to the true-breeding parent with violet flowers. However, we know that the allele donated by the parent with white flowers was not simply lost because it reappeared in some of the F2 offspring. Therefore, the F1 plants must have been genotypically different from the parent with violet flowers. In his 1865 publication, Mendel reported the results of his crosses involving seven different phenotypes, each with two contrasting traits. A trait is defined as a variation in the physical appearance of a heritable characteristic. The characteristics included plant height, seed texture, seed color, flower color, pea pod size, pea pod color, and flower position. To fully examine each characteristic, Mendel generated large numbers of F1 and F2 plants, reporting results from 19,959 F2 plants alone. His findings were consistent. First, Mendel confirmed that he had plants that bred true for white or violet flower color. Regardless of how many generations Mendel examined, all self-crossed offspring of parents with white flowers had white flowers, and all self-crossed offspring of parents with violet flowers had violet flowers. In addition, Mendel confirmed that, other than flower color, the pea plants were physically identical.